We make the world a better place. Our earthquake strategies and high-performance engineering impact economies and save lives. Miyamoto International is a global earthquake structural engineering and project management company providing critical services that sustain industries and safeguard communities around the world. We are experts in delivering earthquake structural engineering and high-performance engineering that reduce lifecycle costs and produce a positive net impact on a structure’s operation. Our broad spectrum of services can be deployed to meet engineering needs or brought together to tackle the complex challenges inherent in pre- and post-disaster environments. Built on decades of earthquake and structural engineering experience in the field, our expertise supports how clients address the economic, political, socio-cultural, sustainability and technical challenges involved in risk reduction and post-disaster recovery. 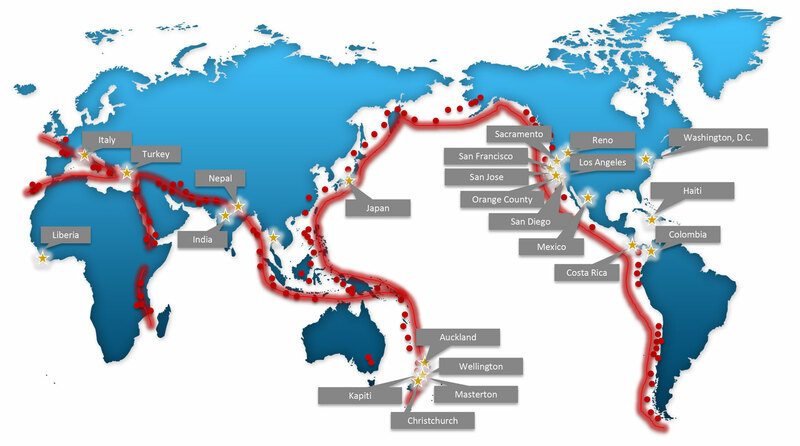 Miyamoto businesses are strategically located worldwide in earthquake-prone regions to impact economies and save lives. Learn more about how Miyamoto Global Disaster Relief is extending the mission of Miyamoto International to save lives through expert structural engineering projects focusing on saving the lives of school children worldwide. Be the undisputed global leader in earthquake structural engineering, high-performance engineering and project management. Take bold actions to fortify business, enrich communities and safeguard humanity. Positively impact society as a 1,000-person firm with business units strategically positioned around the globe. Miyamoto, they bring all the expertise, taking into account the seismic area that we are in. – Richard T. Hale III, The Hale Corp.